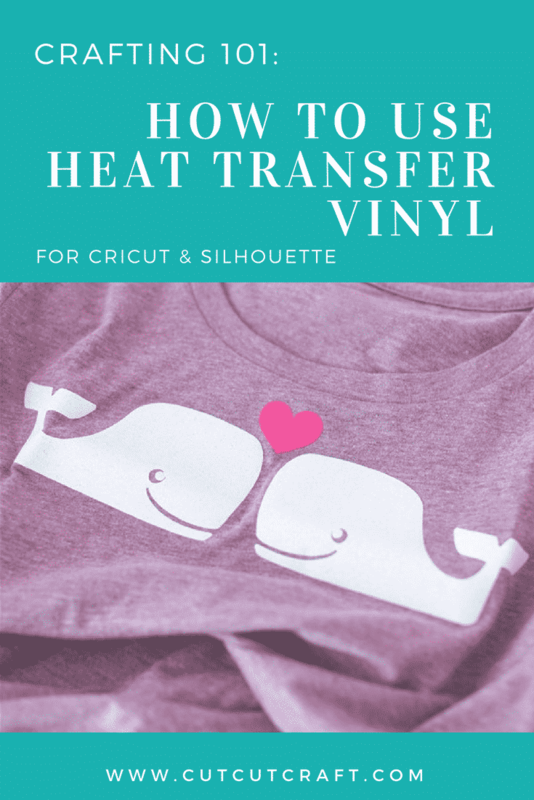 How to Use Heat Transfer Vinyl With Silhouette Cameo 3 | Cut, Cut, Craft! 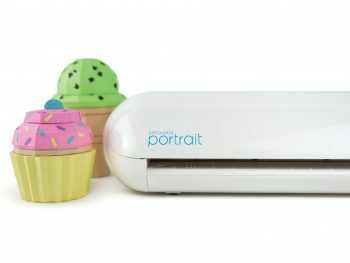 Silhouette Portrait 2 Review: the Best Portable Cutting Machine? 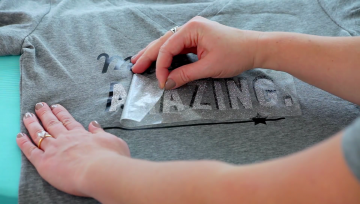 Curious about how to make a DIY t-shirt with heat transfer vinyl? Maybe your Silhouette Cameo 3 came with a few sheets of vinyl you’ve been too scared to try out? Have no fear! I’m here to teach you all the basics. You’ll learn how to use heat transfer vinyl (HTV), and how to make a successful first (or tenth) project. First, I’ll explain what HTV is, how it’s different from regular vinyl, and what it can be used for. Then I’ll take you through a step-by-step tutorial on how to make your very own custom t-shirt: from designing to cutting to applying. I’ll give you a bunch of tips and tricks to make the creation process painless and your finished product beautiful. In the end, I’ll go over the questions I’ve seen and heard the most over the years. What can I apply heat transfer vinyl to? Which HTV should I purchase? How do I iron on letters? Is there a vinyl cutter for t-shirts? Which heat transfer vinyl should I use on shirts? Is cutting HTV different than regular vinyl? Can I use transfer paper or freezer paper? How do I use a heat press? Should I? Which vinyl should I use for a Silhouette machine? What are the settings for glitter HTV? Which side of the transfer paper or parchment paper do you place against the iron? Is the top of the vinyl you use sticky when you remove the backing? How do I make an iron on transfer? Is that different? What do you do with the extra HTV leftover from weeding? What can I make with HTV? How do I get my HTV to stay on after washing it? Do I mirror the design? Can I iron a picture onto a shirt without transfer paper? Which cut settings should I use for HTV? How do I use the Cricut Easy Press? 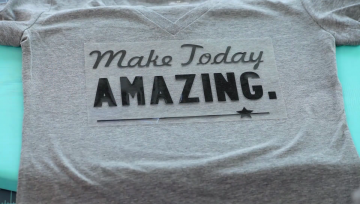 In this tutorial, you’ll learn how to use HTV by making your own custom t-shirt. If you aren’t interested in making t-shirts, the basic principles apply to all sorts of projects: canvas bags, hats, pillows, flags, signs, and more. Like any tutorial that you follow for the first time, I’d suggest using an old or cheap t-shirt to practice on. If you’re feeling a bit more ambitious, I applaud you! HTV is a special type of vinyl that can be bonded to fabrics in just a few seconds using heat and pressure. If you iron on your vinyl properly, it should last for the lifetime of your fabric. Like regular vinyl, heat transfer vinyl can come in individual sheets or large rolls. You can find HTV in a variety of colors and textures: smooth, flocked, glittery, metallic, printable, even holographic! Heat Transfer Vinyl is backed by a clear, plastic transfer sheet, also known as the carrier sheet. The cut design is weeded (excess vinyl removed) while it’s still on this sheet, and then flipped over and ironed onto your fabric. You’ll remove the carrier sheet after ironing. So unlike regular adhesive vinyl, you don’t need to use transfer tape or transfer paper, because the carrier sheet does the job. It’s irreplaceable for making DIY t-shirts, bags, jackets, jerseys, basically any fabric that you want to permanently decorate with a vinyl design. If you grew up in the 80’s, you know about vinyl t-shirts, if not…you missed out. You can apply heat transfer vinyl to most fabrics that can handle a hot iron for about twenty seconds. The exact fabrics depend on the specific type of HTV you are using, so you’ll want to read the manufacturer’s instructions carefully. If this seems like a lot of information to remember: don’t worry about it! HTV is super easy to use and I learn by experimenting so we’ll just dive right in together. 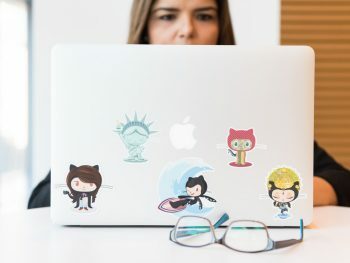 If you don’t have a design already in mind, check out the list (cutcutcraft.com/free-svg-images-cricut-silhouette) I put together of free SVGs that you can import into Silhouette Studio. If you are using the basic version of Silhouette Studio, the Silhouette Cloud has over 100,000 designs you can select from, many of them costing less than $.99. 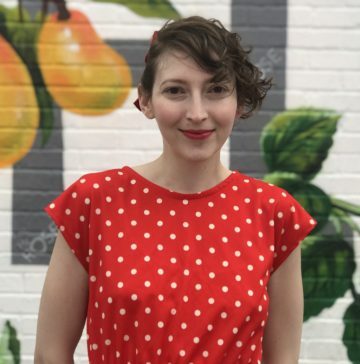 When you purchase a design you own that design forever and can use it for as many projects as you’d like (as long as you picked a pretty one). For your first design, I recommend trying a basic shape. It will be a lot easier to weed and transfer, letting us focus on the heat transfer parts of this tutorial. After you’ve gotten the hang of simple shapes, you can move on to more complicated designs. If you’ll be using lettering in your design, you’ll want to make it as easy on yourself as possible for your first time. I recommend using a large, bold font because thin lettering is more difficult to weed. Cutting HTV is a breeze. I’ll be using Siser EasyWeed vinyl. If you’re using a different type of HTV, make sure to read the manufacturer’s instructions for the cutter settings. 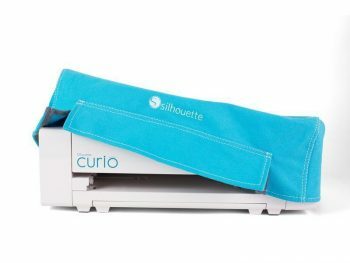 If you have another Silhouette machine (like the Silhouette Portrait 2 or the Silhouette Curio) the instructions are basically the same. Okay, let’s load our design into Silhouette Studio and get it cut. Load your design in Silhouette Studio. 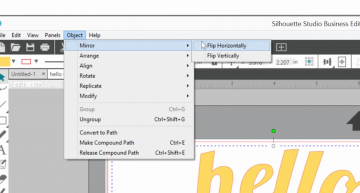 Flip your design (if it isn’t already). You’ll select Object -> Mirror -> Flip Horizontally. Place the HTV on your cutting mat with the shiny plastic backing side down. 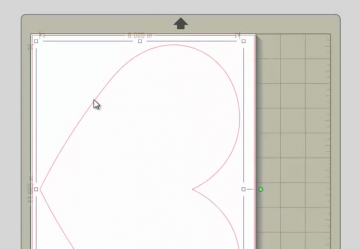 Load the cutting mat into your Silhouette Cameo. Click “Send” down at the bottom, and watch as your design is cut out. Weed the vinyl, removing all the excess vinyl you don’t want to be applied to your t-shirt. Keep the cut design on the clear backing sheet. Use a hooked weeding tool or an X-Acto knife for the small areas. Make sure there aren’t any little bits left on the carrier sheet, or these will be transferred onto your t-shirt! Now that we have our design cut and weeded, it’s time to place it on the surface of our material. Pre-wash your garment so that any shrinkage doesn’t pull at your design after it’s applied. Avoid fabric softener because it might cause the vinyl to not stick as well. Iron or pre-press your garment before you start so any wrinkles or creases don’t interfere with the transfer. This also dries out your fabric, since water interferes with the transfer process. First, you should read the directions specific to the type of HTV you are using. Different brands and styles require different temperatures and time settings to bond well. If you want your design to last for the lifetime of your garment, make sure to follow those directions! If you’re using Siser HTV, here’s a handy PDF that lists the specific directions for each type of vinyl. Place your t-shirt on a clean, firm surface. Preferably not an ironing board! Since heat transfer vinyl needs heat and pressure, a squishy ironing board prevents the vinyl from bonding as well. Set your iron or heat press to the temperature listed in the directions included with your HTV. Siser EasyWeed wants 305°F/150°C, so we’ll be using an iron set to medium-high, between the settings for Cotton and Wool. If you haven’t already, preheat your t-shirt for a few seconds to get rid of any wrinkles and to completely dry out the fabric. With the vinyl design still attached to the carrier sheet, flip it over and align it onto your fabric at the desired location. Cover your design with parchment paper or a thin sheet to protect your iron and so you don’t scorch your fabric. Iron on the design for the time listed in the manufacturer’s directions for your HTV. For EasyWeed, you’ll iron every part of your design with medium to firm pressure for 10-15 seconds. Don’t slide the iron around. Place the iron, press firmly, and then lift the iron up and move it to the next spot until you have covered your entire design. If you notice the vinyl lifting up from your shirt, replace the carrier sheet and parchment paper, and iron for an additional 5 to 10 seconds. Repeat this until all those corners and edges have firmly adhered to your shirt. No steam! No moisture! Keep everything dry. Use a firm surface, not an ironing board. 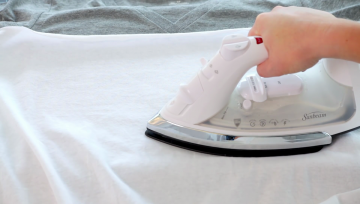 Use the flat part of your iron; avoid the holes where steam can come out. If portions of your design lift up after ironing, re-cover the design and iron for an additional 5-10 seconds. Press the iron with steady, firm pressure. Do not slide the iron around, press firmly on one section of your design at a time. You should be able to see the weave of the fabric through the vinyl you have applied. Always make a test cut! If you have a dull blade or the wrong machine settings, you could easily ruin your material and day. A small test cut takes only an additional minute and can save you quite a bit of heartache. This goes for any new material or project you might be working on. Depending on the type of HTV you’re using, the default settings might not be appropriate. Glitter HTV can be three times as thick as regular HTV! Read the manufacturer’s specifications for your HTV and make a test cut! Don’t forget to mirror your design! Make sure your garment is completely dry, and that there’s no steam coming out of your iron. Wait 24 hours before you wash your finished garment. No dry cleaning after you’ve applied the vinyl. Make sure whichever HTV you purchase is no wider than 12″ or you’ll have to cut it before using it in your Silhouette Cameo 3! Make sure there aren’t any little bits left on the carrier sheet, or these will be transferred onto your t-shirt! If your vinyl isn’t sticking, replace the carrier sheet and iron it again. You can try ironing from the inside as well. I definitely recommend Siser EasyWeed Heat Transfer Vinyl. You can easily make a word design in Silhouette Studio using the text tool. Any fonts you have on your computer can be used. The cutting and transferring process is exactly the same as for any other shape or design. If you have purchased pre-cut iron-on letters, you won’t actually have to cut or weed anything. You can use the adhesive carrier sheet from some old HTV to compose and transfer your design, or just place the letters on your t-shirt by hand. Any vinyl cutter will work on heat transfer vinyl for t-shirts. I recommend Siser’s EasyWeed HTV. Yes, the settings you’ll use on your machine will be different depending on the type of vinyl you use. And you’ll have to make sure to place the shiny plastic side down. You don’t need to use sticky transfer paper since the HTV already comes adhered to a clear backing sheet that is used to transfer your design. To protect your iron, you’ll want to place something between that clear sheet and your iron. I do not recommend freezer paper as it is coated with wax and this can melt onto your iron or the garment you are working on. I recommend using parchment paper, a silicone or teflon sheet, or a spare piece of thin fabric (like an old sheet). A heat press will give absolutely give the most reliable results for long-lasting HTV designs. The large, flat surface is ideal for smoothly transferring designs. You can set the exact temperature recommended by the HTV manufacturer, and pre-heat your garment for the consistant results. However, until you plan on making a lot of t-shirts or selling your finished products, you probably don’t need to invest in one. I reviewed the best choices here: cutcutcraft.com/best-vinyl-cricut-silhouette. You can find the Siser settings for other machines at the bottom of their page here. Glitter HTV generally takes a higher temperature and pressure than regular HTV. For Siser Glitter, set your iron between Cotton and Linen (320°F/160°C) and press hard for 10-15 seconds. You generally don’t need to use adhesive transfer paper because HTV comes with its own clear backing. If your heat transfer vinyl did not come with a backing, use transfer paper or transfer tape that can handle heat. (A carrier sheet from some old HTV should work, if it’s still sticky enough.) And you’ll want to place it sticky-side down! No, the vinyl won’t be sticky at all if you peel it off the backing. Just follow the above tutorial! When people talk about iron on transfers they’re talking about using heat transfer vinyl! Generally, I toss it. It is possible, but difficult, to reuse scrap HTV. The vinyl won’t have the clear backing, so you’ll stick it directly to your cutting mat and use transfer paper to get it onto your t-shirt. 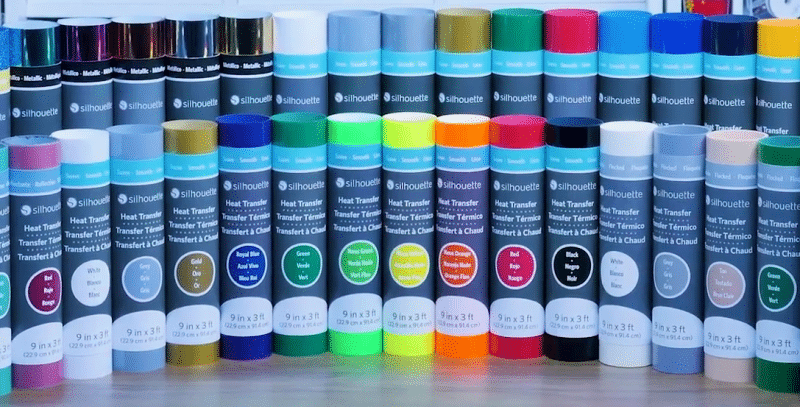 Unfortunately, smooth HTV is very thin and gets easily stretched, so it does not hold up to getting cut and pulled off adhesive sheets multiple times. But this does work with thick vinyl like Glitter HTV. You can make anything you dream up! HTV is great for t-shirts, bags, jackets, jerseys, headbands, pillows, flags, signs, and more. Make sure you pre-wash the fabric to prevent shrinking that can pull at your design. Iron your fabric before applying the vinyl to get rid of wrinkles. Press firmly with the iron over each part of your design, without sliding the iron around. If you’re using something thick like a towel in between the iron and the vinyl, try a thinner sheet or parchment paper instead. Wait 24 hours before the first wash. Wash your garment inside out in cold water, dryer settings as usual, and don’t dry clean. If the design is pulling off your fabric, try ironing again for 5-10 seconds. Yes, designs for HTV must be mirrored, otherwise it will be backwards on the final product. Make sure to look at your design to see if it’s already mirrored before you select the option in Silhouette Studio. If you want to iron on a picture onto a t-shirt, you’ll want to use a printable heat transfer vinyl, so you can print your picture and then iron it onto your shirt. I’m thinking about writing a tutorial fully explaining how to do this, so if that would be helpful, let me know in the comments! For the Cricut Explore, choose “Heat Transfer Vinyl” and select “Smooth” for smooth, and “Flocked” for fuzzy or glitter HTV. 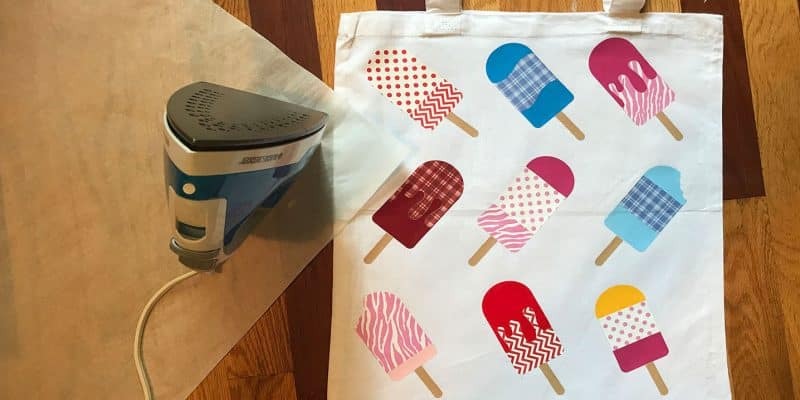 Lorrie Nunemaker has a tutorial that uses the Cricut Maker, Easy Press, and HeatNBond that should help you out! Hi, I’m Ali! I love DIY crafts, teaching, & my kiddos (not in that order most days). If you have any questions about crafting or suggestions for reviews, just let me know!